Approved by the ARLIS Founders Board on April 3, 2012.
if the item is also in the collection of another library, unless simultaneous requests are generated and fulfilled. The reasons for removing the item from the collection must be clearly stated in the requesting letter. ARLIS librarians may seek input from experts in the subject matter to verify the need for withdrawal from the ARLIS collection. Items will not be withdrawn from ARLIS to satisfy differences of opinion on a topic, to gain parity in the number of items on a given topic, or to screen legally available information from the public. If an acceptable resolution involves ARLIS staff redacting challenged information from the item, the requesting agency will provide an information sheet explaining the necessary omissions. If the item is considered outdated or superseded, ARLIS may instead denote this status via a disclaimer on the front cover and/or title page and a note in the catalog record. The final decision regarding challenged materials will be the responsibility of the ARLIS Management Team. ARLIS shares a catalog and circulation system and participates in cooperative borrowing with Anchorage Public Libraries (APL), UAA/APU Consortium Library (UAA), and Anchorage Museum Library. ARLIS loans materials to patrons using library cards from any participating library and most borrowing privileges are uniform. Founding agency staff may check out an unlimited number of ARLIS items for 4 weeks with unlimited renewals, with the exception of kits, furs, skulls and mounts which circulate to all borrowers for 2 weeks with one renewal. Library users not affiliated with a founding agency may check out up to 25 ARLIS items at a time for 4 weeks with one renewal for most materials. Two kits may be checked out for 2 weeks with one renewal and are included in the 25-item limit. 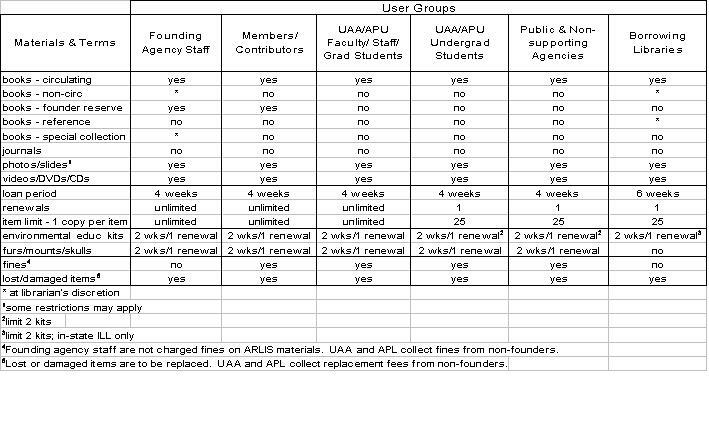 ARLIS loans materials to library users and other libraries according to the table below. Some restrictions may apply. Exceptions may be made for founding agency staff and other libraries at the discretion of ARLIS reference and interlibrary loan staff. Library users in violation of the ARLIS Public Code of Conduct may be asked for identification; may be subject to a search of backpacks or bags; may be asked to leave or be permanently banned from ARLIS, and/or reported to University Police. Other disciplinary or legal action may be taken in accordance with applicable laws and policies. ARLIS assumes no responsibility for personal belongings or for the actions or activities of any individuals or groups using ARLIS premises. Use ARLIS computers, equipment or facilities only for research purposes within the ARLIS scope and mission: Alaska natural and cultural resources. Be aware that compliance with the ARLIS Internet Policy will be strictly enforced and applies to the use of ARLIS public computers and patron laptop computers. Comply with all ARLIS policies and signage. All policies are available at www.arlis.org and at the ARLIS reference desk. Limit equipment use during times of heavy demand. Arrange seven days in advance for computer use by large groups. Respond to emergency and security gate alarms and other situations as instructed by staff. Limit use of the library to authorized areas only. Have drinks in covered containers. University students are also expected to comply with the UAA Student Code of Conduct. Behaviors that infringe upon the rights of library users or staff are prohibited and include, but are not limited to, the following. Damage, deface, destroy, alter, misuse or steal library materials, equipment, computer hardware, software, or facilities. Exhibit any threatening or intimidating behaviors to others; e.g., abusive language, threats of violence or harassment. Create disturbances by engaging in loud conversation or disorderly, boisterous or disruptive behavior. Use cell phones, audio equipment or musical instruments in a manner that is distracting to others or interferes with library service. Solicit or sell items for commercial, personal, political or religious purposes within ARLIS, or distribute, display or post materials that have not been previously approved by the ARLIS Management Team. Relocate ARLIS furniture or equipment without the permission of ARLIS staff. Photograph or videotape within ARLIS without prior approval from ARLIS staff, with the exception of photographs of documents for research purposes. Enter an unauthorized area without staff approval or remain in the library after the building closes or when requested to leave during emergency situations. Leave children under 12 years of age unattended. Possess or use alcohol or controlled substances on ARLIS premises. Smoke in the library building. Carry weapons of any type. Litter or consume meals in ARLIS and must dispose of trash in appropriate receptacles. Use library restroom facilities for inappropriate purposes such as loitering, bathing, shaving, or laundering clothes. Interfere with the use of an area by another person by offensive personal hygiene or inappropriate bodily function, or have personal hygiene that materially disrupts others from using library facilities, collections or services. Neglect to wear appropriate clothing such as shirts or footwear. Use ARLIS for overnight lodging; engage in prolonged or chronic sleeping; or sleep on the floor in the library. Bring animals into the facility, with the exception of service animals assisting patrons experiencing disabilities. Leave personal belongings unattended for extended periods or bring in excessive items that cannot be stowed under a standard study chair. Engage in any other illegal acts or conduct in violation of federal, state or local law, ordinance or regulation. The ARLIS collection will focus on the research and information needs of its founding agencies, primarily in the areas of natural resources and cultural resources management in Alaska. Subject area emphases are wildlife and fisheries biology and habitat, arctic issues, traditional knowledge, resource development, mineral industries, land use planning, earth science, environmental studies, pollution studies, oil spills, and conservation. The ARLIS collection will likewise serve as an information resource for the constituency of its founding agencies, the public, university students, the business community, and individuals and groups involved in natural resources conservation and development. ARLIS will acquire materials appropriate to the use of these groups in the designated subject areas. ARLIS will participate in cooperative collection development with public and university libraries to minimize duplication and to perpetuate a largely unique collection in Anchorage. ARLIS shares a catalog and circulation system and participates in cooperative borrowing with Anchorage Public Libraries (APL), UAA/APU Consortium Library (UAA), and Anchorage Museum Atwood Resource Center. ARLIS loans materials to patrons using library cards from any participating library and issues ARLIS cards to eligible founders, sponsored founders, and contributors. Members of the public may be eligible for an ARLIS card, if they do not have a valid card from a partner library. ARLIS cards are issued for a five-year period and may be renewed for eligible patrons. if the patron does not have a card from another library and is otherwise eligible for an ARLIS card, the status is changed from Founder to Public and the record is retained. if the patron does not have a card from another library and is otherwise eligible for an ARLIS card, the status is changed from Sponsored Founder to Public and the record is retained. f the patron does not have a card from another library and is otherwise eligible for an ARLIS card, the status is changed from Contributor to Public and the record is retained. if the patron does not have a card from another library and is otherwise eligible for an ARLIS card, the status is changed to Public and the record is retained. Anchorage residents without a valid library card from a partner library may receive an ARLIS card upon approval of a written application. Photo ID is required. Out-of-town patrons are encouraged to borrow ARLIS materials through interlibrary loan from their local library. Remote in-state patrons without local interlibrary loan service may contact the Alaska State Library to find out which regional ILL library serves them. In-state out-of-town patrons who visit ARLIS may check out ARLIS materials at the UAA/APU Consortium Library via the Reciprocal Borrowing Program, if they meet the program requirements. Employees from each agency will abide by their employer's dismissal policy. Employees who are not dismissed from work will continue their shift at ARLIS. If the number of reference librarians becomes insufficient to adequately staff the ARLIS reference desk, it will close for the remainder of the day and the collection will be secured in the same manner as during non-business hours. Signs will be posted to alert users to closures. Interlibrary Loan services can be viewed in detail on the ILLiad Services page. The library is staffed 8 a.m.-5 p.m., Monday through Friday. The reference desk is staffed between 10 a.m. and 4 p.m., Monday through Friday. The library will be closed for holidays that are observed by both the state and federal government. The library will attempt to remain open on holidays that are not shared between the state and federal government. The library will follow the closures of the Federal Building for weather or emergencies. Staff members who are not released will continue to work and will provide reference assistance. If insufficient staff remain, the reference desk will close. ARLIS provides free parking to library users employed by founding agencies. Free parking is available via a numerical parking code entered into the Pay N' Park Stations in the UAA Central Parking Garage, East Parking Garage and East Parking Lot. To receive the code, employees of founding agencies must be registered as an ARLIS founder and have an ARLIS library card. Founding agency staff holding meetings at ARLIS may obtain free parking for non-agency attendees via hang-tag passes. Founders holding meetings at ARLIS may obtain hang-tag passes for non-founding agency attendees. ARLIS provides free parking to library users with sponsored founder status. Free parking is available via hang-tag passes distributed at the ARLIS reference desk Monday through Friday, 10 a.m. to 4 p.m. ARLIS hang-tag passes may be used in the Central Parking Garage, East Parking Garage and any parking lot on campus. ARLIS provides free parking to library users who are employed by contributing organizations. Free parking is available via hang-tag passes distributed at the ARLIS reference desk Monday through Friday, 10 a.m. to 4 p.m. ARLIS hang-tag passes may be used in the Central Parking Garage, East Parking Garage and any parking lot on campus. ARLIS provides free parking to members of the public visiting ARLIS for research purposes related to the scope and mission of the library. Free parking is available via hang-tag passes distributed at the ARLIS reference desk Monday through Friday, 10 a.m. to 4 p.m. ARLIS hang-tag passes may be used in the Central Parking Garage, East Parking Garage and any parking lot on campus. Members of the public with library fines in excess of $5 are not eligible for free parking at ARLIS. Due to UAA policies, ARLIS cannot provide free parking to UAA students, staff and faculty. Search terms used to get to our web site from an external search engine and terms used on our site with the Google Custom Search box. This information does not identify you personally. The information collected is part of a systems log file, and is only used internally for site management purposes. This information is collected to create summary statistics, which are used for such purposes as assessing what information is of most and least interest, determining technical design specifications, and identifying system performance or problem areas. ARLIS uses the information to measure the number of visitors to the different sections of the ARLIS site, and to help make our site more useful to visitors. Employees of the organizations which fund ARLIS, as Founding agencies or Contributors, are permitted to register online for desktop access to e-journals and databases and document delivery services. Registrants submit information including their name, employer and contact information. Credit card information is never solicited or collected. Names and contact information in ARLIS databases are managed as confidential library records. You do not have to provide personal information to visit the ARLIS website. If you choose to provide personal information, such as by sending an e-mail which includes your name and contact information, ARLIS librarians will use the information you provide to respond to you. Please do not send sensitive information, such as your credit card or social security numbers. ARLIS does not solicit or collect such information. ARLIS does not collect information for commercial marketing purposes. ARLIS web pages may use session cookies for technical purposes such as to enable better navigation through the site, or to allow you to customize your preferences for interacting with the site. ARLIS web pages may also make use of persistent cookies to remember you between visits so, for example, you can save your customized preference settings for future visits. If you do not wish to have session or persistent cookies stored on your machine, you can turn them off in your browser. However, this may affect the functioning of some web sites. "Like many services, Google Analytics uses ... cookies to track visitor interactions. These cookies are used to store information, such as what time the current visit occurred, whether the visitor has been to the site before, and what site referred the visitor to the web page. Browsers do not share ... cookies across domains" (from the Google Analytics privacy overview). Google's policies on privacy and related issues are available at www.google.com/analytics/learn/privacy.html. ARLIS does not use the Google AdWords program. For site security and to ensure this service remains available to all users, ARLIS uses software programs to monitor network traffic to identify unauthorized attempts to upload or change information, or otherwise cause damage. Except for authorized law enforcement investigations, no other attempts are made to identify individual users or their usage habits. ARLIS uses virus protection measures on our computer systems and regularly update the software. These are computer security measure that, in addition to maintaining our computer systems, also ensure that all files that we develop and/or post on our web servers are virus-free. When you request a file for download from our site, it is possible, though unlikely, that the data may contract a virus and become corrupted before it reaches your computer. ARLIS is not responsible for files that may become corrupted as the data travels the Internet. Public review form available here (PDF, 81.2KB). Due to UAA's proximity and its need for curriculum support, as well as ARLIS's need to ensure access to its collection by its founder agencies, ARLIS will participate in a limited reserve service for UAA faculty and students. Books will be placed into non-circulation status for the duration of the reserve. However, founder needs take precedence whenever there are conflicting demands for materials. Items may be weeded from the ARLIS collection if there is an excess number of copies or if copies have become worn out or damaged. In the event that collection development staff in cooperation with the ARLIS Management Team determines an excess number of copies exists for a particular title in the ARLIS collection, copies with barcodes from ADF&G, AEIDC, ARLIS, BLM, FWS, MMS, NPS, or USGS may be weeded from the collection and the associated record deleted from the ARLIS catalog. The original OSPIC collection must remain whole and no item with an OSPIC barcode may be weeded from the ARLIS collection. An item may also be weeded, barring historic or intrinsic value, if its edition has been superseded or information outdated, or if the subject matter is determined to be outside the scope of ARLIS’s collection development policy. Collection development staff must consult with the agency librarian who brought more than one copy to the collection regarding sufficiency issues. In the event of excess copies, wear is the first consideration for weeding. After wear is considered, BLM’s Alaska Resources Library barcoded item may be the first library copy weeded. Cataloged AEIDC items weeded from the ARLIS collection will be offered back to the AEIDC librarian rather than discarding. Excess items (whether cataloged or gifted) having to do with oil spills or items produced by FWS will be offered back to OSPIC and FWS librarians rather than discarding. Items generated by NPS that are being discarded will examined by Frank Norris of NPS before discarding. Bar codes from weeded cataloged items should be removed from the ARLIS catalog after collection development staff, in cooperation with the ARLIS management team, has approved the discard of a cataloged item.